While working in DeRidder, Louisiana I drove down to Orange, Texas to visit the site of the WW II Consolidated Steel Shipyard or so I thought... As it turned out, it was a little harder than I imagined because Consolidated has been out of business for quite some time, as has every other shipyard in Orange. Today, the town is home to manufacturers of sea-going oil derricks and platforms and small ship repair companies. I drove around the water's edge until and noticed a large number of WW II era Quonset huts and buildings. With street names like "Destroyer Drive", "Farragut Avenue", and "Turret Road" I knew I was close. About to give up, I noticed a guard shack and stopped to ask the guard for directions. Typical of southern hospitality, he gave me a cold soda (it was during the heat wave and the temperature outside was 109 degrees) and we sat down in his air-conditioned building for a lengthy talk about Orange history (he talked, I listened). He had been born and raised in Orange before joining the Army, serving 23 years and retiring. During WW II, the Consolidated Steel Shipyard was a major player in the shipbuilding business and won several contracts to manufacture battleships and warships, to include Destroyer Escorts. Immediately, Consolidated needed 5,000 skilled welders and laborers to fulfill the orders. Unfortunately for Orange, there weren't 5,000 extra people sitting around counting flies. At the time, most of the American men were serving in armed forces. The nearest large pool of labor was Beaumont, Texas, about 60 miles away, but few of them had cars to drive. Those that did were subject to gas rationing and couldn't afford to drive the 60 mile round-trip. For those of you that recall, category-A coupons only authorized you to 3-gallons per week! Given the condition of the roads and the inefficiency of gasoline engines, the trip would have required 5-6 gallons of gas per day. Consolidated was determined. After all, there was money to be made. As it happened, a train was procured and carried several thousand workers, mostly women, back and forth between Orange and Beaumont. Each morning the train pulled in and parked along West Front Street (see map above right). When the whistle blew at night, the train took them all home. Many people, families mostly, moved to Orange in search of work and found it at the shipyard. There was not enough housing to handle the sudden influx of so many people, so most of them lived in tents or shacks for most of their time in Orange. At the end of WW II, the Navy canceled many outstanding contracts and most of the wartime workforce moved away, leaving Orange a virtual ghost town. As I mentioned, many thousands of the shipbuilding workforce were women. At first, the government was hesitant to entrust shipbuilding, welding, riveting and other traditionally "male tasks" to an unproven female workforce. Before long, however, the women proved themselves more than capable. In fact, many of the female welding crews had established reputations for high quality work. For a time following the war Consolidated tried to stay in business by building warships for foreign governments. As the story goes, a representative from Turkey came to Orange to negotiate for construction of a new ship. During the negotiations, the representative insisted that a specific all-female crew perform all welding on the hull and put this contingency into the contract. Since the women specified had long-since quit at the end of the war, they had to be rehired (at greatly increased wages) to perform the work. Talk about a good reputation! A foreign government requesting female welders by name! After my "history lesson" my guard friend agreed to take me on an "unauthorized" tour of the old shipyard, hence my inability to name him. I was not allowed to take pictures of any modern facility as the oil rig industry apparently has many trade secrets about construction techniques. The piers for "final fitting" were north of Front Street in the gray area (on the map above right). 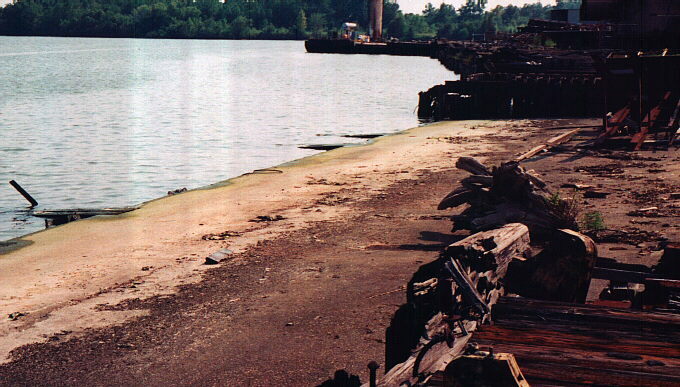 The hulls were assembled on sloped ramps on top of wood skids and "splashed" sideways off the peninsula south of Front Street (in the picture above, it was near the word "Sabine" in the river). While building the Destroyer Escorts, Consolidated tried to launch a ship every Saturday! The entire town turned out to watch the "splashing" of a new ship. What a site it must have been! Just prior to each launch, a woman with a bucket full of pig fat would smear it on each of the skids to help the ship slide into the Sabine river. Now you know the origin of the phrase "grease the skids." The ships were launched as little more than an empty hull. No sooner had the water settled from the launch than a tug hooked up and towed it to the nearby piers for final fitting out. The piers, unfortunately, are long gone but the signs indicating the pier numbers remain to this day. There is only one ramp left at the old Consolidated Steel Shipyard. At the end of each ramp was the ship foreman's & engineer's office. What an efficient use of space! The only remaining concrete pad is covered with junk. I am told it is 325 feet wide the DEs were 306 feet long. The DEs were built at the top next to the railroad track supply line (not the one visible at the right). Once complete, they slid the length of the pad into the river. Ever wonder how many pigs it took to get enough grease to launch 546 DEs? 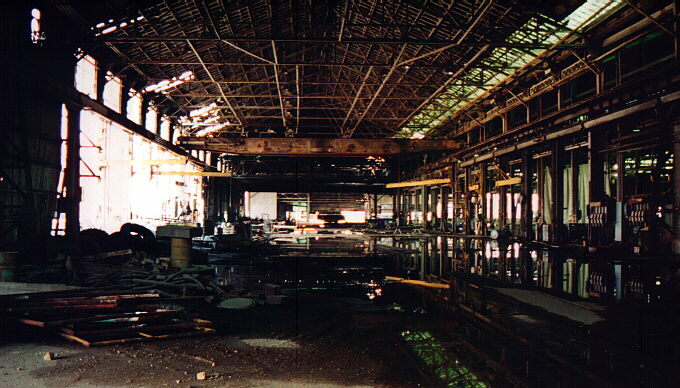 The inside of the huge workshop visible in the picture above. The train tracks run down the right side and delivered pre-constructed components (like pilothouses, smokestacks, etc) directly from hundreds of subcontractors. DE construction was probably one of the first projects to use Just-In-Time (JIT) construction techniques, a method the Japanese adopted from us in the 60s.